The desire to have intuitive, seamless 3D interaction fuels research exploration into new approaches to 3D interaction. However, within these explorations we continue to rely on Brunelleschi's perspective for display and map the interactive control space directly into it without much thought on the effect that this default mapping has. In contrast, there are many possibilities for creating 3D interaction spaces, thus making it important to run user studies to examine these possibilities. 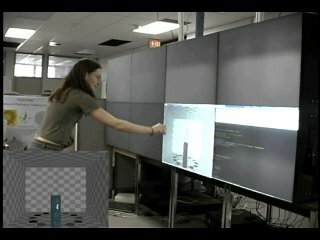 Options in mapping the control space to the display space for 3D interaction have previously focused on the manipulation of control-display ratio or gain. In this paper, we present a conceptual framework that provides a more general control-display description that includes mappings for flip, rotation, skew, as well as scale (gain). We conduct a user study to explore 3D selection and manipulation tasks in three of these different mappings in comparison to the commonly used mapping (perspective mapping of control space to a perspective display). Our results show interesting differences between interactions and user preferences in these mappings and indicate that all may be considered viable alternatives. Together this framework and study open the door to further exploration of 3D interaction variations.